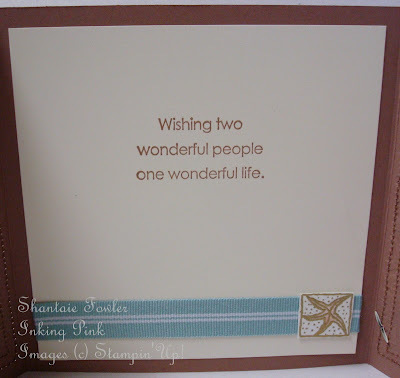 This weeks challenge over at cuttlebug challenge blog is to make something for a wedding, the host of this weeks challenge is creative cuts and more. I'm going to a Wedding this Saturday on the Beach in St Augustine My friend Lynnette has chosen an evening ceremony,its going to be beautiful and casual. I wanted my card to reflect the colors and style of her wedding. I started with a 51/2 inch square close to cocoa card with a gate fold it really doesn't show but I did run the "gates' through the swirls embossing folder..it wasn't a total waste of time you can see it from the inside :) I embossed the vanilla panels with the swirls as well because to me it looks like waves from the ocean. I stitched two rows, once inside the panel and once just outside of it. The inside of the card is pretty to look at, and is still functional. 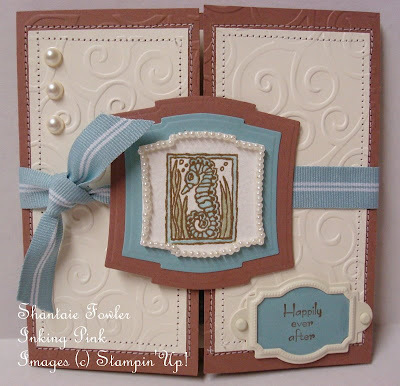 I added the ribbon to carry the baja breeze to the inside.Lynnette has ALL my "beachy" stamps except for this set so I stamped the image on water color paper and embossed in gold and cut the little starfish out. 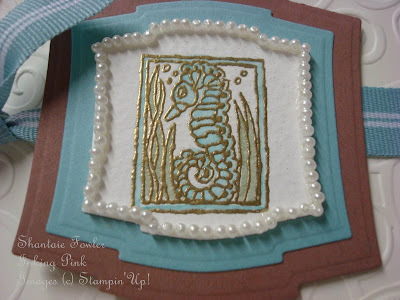 I know she will love this card, and wonder how I made a card when she has ALL my other beach stamps, now to make 5 dozen 4 inch royal icing decorated starfish and seahorse cookies!!! I will post pics I promise! This is absolutely perfect for a beach wedding Shantaie, I love it! Beautiful colours and the pearl border was well worth the effort! Thanks for joining us this week at Cuttlebug Challenges!